Nowadays Internet has made it easier than ever to book your flights but it can still be a painful and stressful experience. You don’t want to pay a high price to see the same ticket at a lower price just a few days later. In this article we will teach you how and when to find the best flight deals. First of all, it all depends if you’re booking a domestic (flights within the US and EU) or an international flight. According to a study conducted by Expedia and the Airlines Reporting Corporation (ARC), you should start booking your domestic flights as of 50 to 100 days before departure. If you’re flying overseas, then you should plan even further ahead, ideally between 150 and 225 days in advance. Note that the best deals for international routes were found around day 171. Needless to say that the closer you get to your scheduled departure date, the higher the rates. As of 3 weeks prior to departure, flight rates start to peak. Why is it so hard to find some cheap, last-minute flights? The answer is simple: Selling 5 seats at €500 is much more profitable for an airline than selling the last 20 seats at only €100. Source: “New Heights for Air Travel”, a study by Expedia and the Airlines Reporting Corporation (ARC). 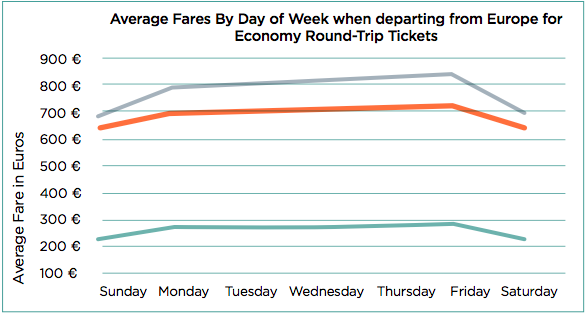 What are the best days of the week to book my flight? Generally speaking, weekends are the best time to book your tickets with Sunday being by far the best day of the week and Friday the worst. This is largely influenced by business travelers, who tend to buy their tickets at the end of the week. 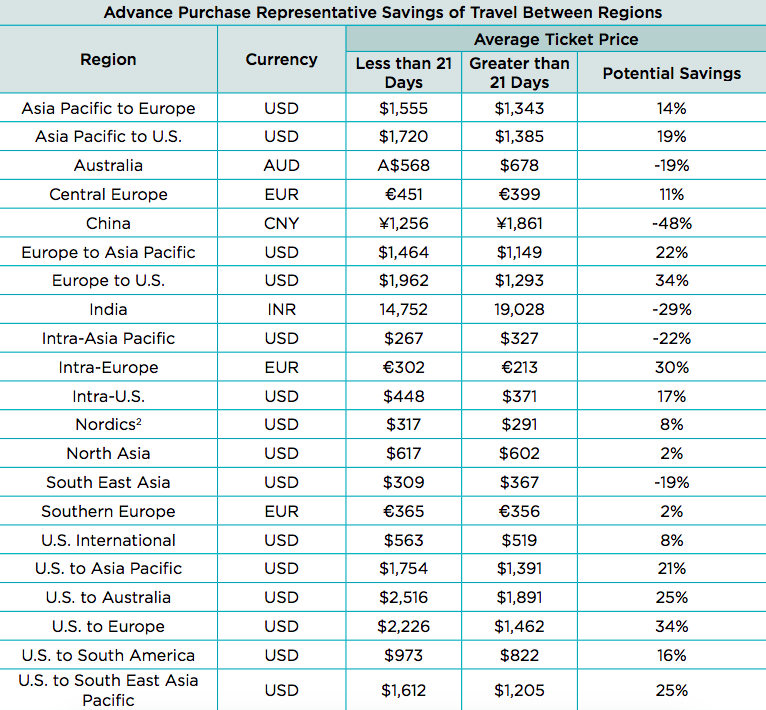 Sunday savings is a global trend that can be found whatever your departure city might be. Let’s have a look at the below graph and table: The lowest rate for travelers departing from Europe and traveling to other destinations in Europe were found on Sunday, with savings up to 30%. Sunday bookings from Europe can save you up to 13% for flights to Asia and up to 22% for flights to the US. Please note that although the percentages slightly vary, the same trend was found for other regions. Traveling has never been more easy and cheaper than the past years. Prices of tickets continue to drop due to the increased competition between airlines. However, it’s a tricky system and we hope that these guidelines help you to better understand the fluctuation of prices. Contact us today and we will be happy to assist you and to save you money on your upcoming trip!